James Beattie's brace helped Stoke end a run of five Premier League games without a win while extending West Ham's winless run to seven games. The striker smashed in a penalty after Matthew Etherington had been felled by Julien Faubert but Matthew Upson levelled with a free header. Beattie tucked in Stoke's winner after Ricardo Fuller's angled shot had been pushed into his path by Robert Green. Stoke's Robert Huth appeared to punch Upson late on but escaped punishment. Referee Martin Atkinson and his fellow officials missed the incident despite the England centre-back being forced to leave the field with blood pouring from a wound near to his right eye. Upson had been caught in the face by a stray Ryan Shawcross boot earlier in the game and Huth's flailing right arm, while the players were waiting for a West Ham free-kick to be delivered into the box, re-opened the wound. Stoke ultimately deserved their victory for a typically tenacious and high-energy performance that unsettled the Hammers from the outset. Etherington, who played 195 times for West Ham, provided most of the early threat for the home side. He raced on to Fuller's clever back-heeled pass before being scythed down by Faubert, who was booked for his challenge, to win the penalty. Beattie's strike from the spot was clinical, flying beyond West Ham keeper Green's dive into his top right-hand corner. Left winger Etherington then appeared on the right before cutting in on his favoured foot, but James Tomkins deflected his 25-yard effort wide. West Ham, by contrast, were struggling to string passes together, although much of that was down to Tony Pulis's well-drilled Stoke side as to the failings of the Hammers to find their own players. Alessandro Diamanti had their first shot on target some 30 minutes into the game, but even that came from a set-piece after he was fouled by Salif Diao. 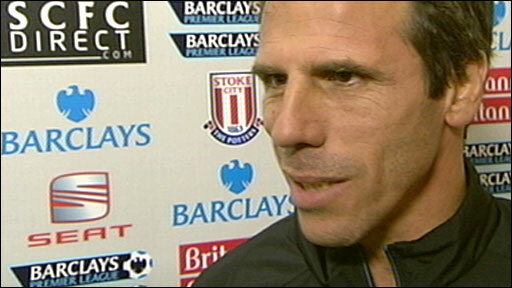 The Italian picked himself up, but tamely struck the 30-yard free-kick straight at Thomas Sorensen in the Stoke goal. But the Hammers were level a couple of minutes later when an uncharacteristic lapse of confidence in the home defence gifted them an equaliser. It came from another set-piece as defender Upson was allowed to rise unchallenged eight yards out and powerfully nod in Mark Noble's corner. After the break, West Ham boss Gianfranco Zola pushed Diamanti further forward to help top scorer Carlton Cole, who had spent the first half playing as a lone striker and being well marshalled by Stoke centre-back Shawcross. Zola's decision almost paid dividends straight away as the midfielder produced a neat turn on the edge of the box, but his left-footed curling effort was comfortably saved by Sorensen, who later held a low striker from the Italian. Stoke's forays forward were becoming increasingly rare, although Shawcross did momentarily leave his defending duties on Cole to head goalwards. Shawcross' effort was blocked by Valon Behrami and he blazed the follow-up wide. The centre-back was soon back on defensive alert though to block an effort from Cole, who had escaped his attention for the first and only time of the afternoon. It proved a crucial intervention as moments later Beattie scored the winner. Fuller skipped past Upson's challenge and raced into the box and when his angled low shot was pushed away by Green, the Stoke striker was on hand to turn the ball in from close range. West Ham brought on striker Zavon Hines, but the youngster was unable to proved the spark West Ham needed. And as the Hammers pushed more and more men forward in search of a second equaliser, Stoke were able to exploit the gaps opening up at the other end of the pitch. And Etherington almost had the last word, but his header from Liam Lawrence's cross flew just wide. "I'll have a look at the Robert Huth incident and if he's done anything wrong then we'll deal with it in house. "It was a good performance. We knew West Ham would have a lot of the ball so we had to try and keep our shape and wait for the gaps and holes to open up. "Then we looked dangerous on the counter-attack and we could have scored a couple more in the last half an hour. "Beattie and Fuller were a handful up front, but it was a good performance all round and Shawcross's block on Cole was the turning point." 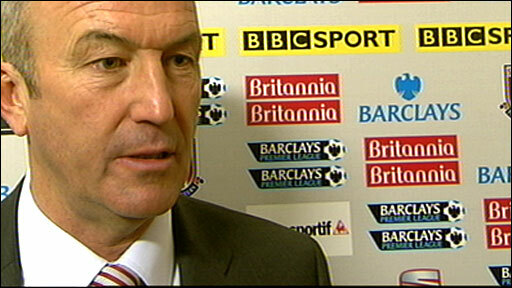 "I have seen the incident involving Robert Huth and Matthew Upson on the video and it should have been a red card. "Probably the referee didn't see it and that is the only justification I can give for it. "It was another tough match but we did not deserve to lose. "The performance was encouraging and I can only tell the players to continue as the corner is close to being turned." 90:00+5:49 The final whistle is blown by the referee. 90:00+5:26 Foul by Liam Lawrence on Julien Faubert, free kick awarded. Julien Faubert restarts play with the free kick. 90:00+4:30 Unfair challenge on Liam Lawrence by Julien Faubert results in a free kick. Danny Collins restarts play with the free kick. 90:00+2:57 Julien Faubert crosses the ball, Ryan Shawcross manages to make a clearance. 90:00+0:35 Mark Noble restarts play with the free kick. 90:00+0:35 Booking Glenn Whelan shown a yellow card. 90:00+0:31 Glenn Whelan gives away a free kick for an unfair challenge on Zavon Hines. 88:38 Centre by Guillermo Franco. 88:25 Substitution Guillermo Franco on for Jack Collison. 86:44 Glenn Whelan takes a shot. Blocked by Valon Behrami. 85:55 Inswinging corner taken by Matthew Etherington, Junior Stanislas manages to make a clearance. 84:36 Free kick taken by Thomas Sorensen. 84:36 Booking The referee shows Zavon Hines a yellow card for unsporting behaviour. 84:30 Zavon Hines concedes a free kick for a foul on Liam Lawrence. 82:49 Substitution James Beattie goes off and Dave Kitson comes on. 82:33 Substitution Radoslav Kovac goes off and Junior Stanislas comes on. 80:54 Carlton Cole fouled by Dean Whitehead, the ref awards a free kick. Direct effort from the free kick comes in from Mark Noble, save by Thomas Sorensen. 80:39 Mark Noble takes a shot. Blocked by Robert Huth. 80:31 A cross is delivered by Valon Behrami. 79:59 The ball is delivered by Zavon Hines, clearance by Ryan Shawcross. 79:16 Glenn Whelan has an effort at goal from just outside the box which goes wide of the left-hand upright. 78:30 Liam Lawrence produces a cross, clearance by Matthew Upson. 76:58 Thomas Sorensen takes the indirect free kick. 76:58 Substitution Zavon Hines on for Alessandro Diamanti. 76:58 Substitution Glenn Whelan is brought on as a substitute for Salif Diao. 76:58 Corner taken right-footed by Alessandro Diamanti, free kick awarded for an unfair challenge on Ryan Shawcross by Carlton Cole. 76:36 Corner taken by Alessandro Diamanti from the right by-line, clearance by Robert Huth. 76:16 The ball is delivered by Liam Lawrence, Close range header by Matthew Etherington goes wide of the left-hand upright. 74:39 Free kick taken by Thomas Sorensen. 74:39 Booking The referee shows Carlton Cole a yellow card. 74:34 Thomas Sorensen fouled by Carlton Cole, the ref awards a free kick. 71:02 Free kick awarded for an unfair challenge on Valon Behrami by James Beattie. Alessandro Diamanti takes the free kick. 68:54 Ricardo Fuller provided the assist for the goal. 68:54 GOAL - James Beattie:Stoke 2 - 1 West Ham James Beattie grabs a goal from inside the six-yard box to the bottom left corner of the goal. Stoke 2-1 West Ham. 68:49 Ricardo Fuller takes a shot. Save by Thomas Sorensen. 67:42 Substitution Liam Lawrence on for Rory Delap. 67:06 Inswinging corner taken from the right by-line by Alessandro Diamanti. 66:43 Carlton Cole takes a shot. Ryan Shawcross gets a block in. 65:07 Unfair challenge on James Beattie by Carlton Cole results in a free kick. Free kick taken by Thomas Sorensen. 65:01 The ball is crossed by Mark Noble. 63:28 Foul by Radoslav Kovac on Dean Whitehead, free kick awarded. Abdoulaye Faye restarts play with the free kick. 62:52 Alessandro Diamanti takes a shot. Save by Thomas Sorensen. 57:56 Dean Whitehead challenges Alessandro Diamanti unfairly and gives away a free kick. Mark Noble takes the free kick. 57:09 A cross is delivered by Rory Delap, Julien Faubert makes a clearance. 56:12 Inswinging corner taken left-footed by Alessandro Diamanti, Thomas Sorensen makes a save. 55:38 Free kick awarded for a foul by Carlton Cole on Ryan Shawcross. Thomas Sorensen takes the indirect free kick. 54:18 Corner taken left-footed by Matthew Etherington, Ryan Shawcross takes a shot. Blocked by Radoslav Kovac. Close range effort by Ryan Shawcross misses to the left of the target. 52:28 James Beattie produces a right-footed shot from deep inside the penalty area which goes wide of the right-hand post. 51:30 Mark Noble challenges Salif Diao unfairly and gives away a free kick. Free kick taken by Thomas Sorensen. 50:37 Free kick awarded for a foul by Valon Behrami on Matthew Etherington. Matthew Etherington takes the indirect free kick. 50:17 The offside flag is raised against Alessandro Diamanti. Thomas Sorensen restarts play with the free kick. 49:41 Free kick awarded for an unfair challenge on Valon Behrami by Ricardo Fuller. Free kick taken by Valon Behrami. 49:17 Alessandro Diamanti takes a shot. Save by Thomas Sorensen. 49:07 The ball is crossed by James Tomkins, clearance by Robert Huth. 48:27 Foul by Ricardo Fuller on James Tomkins, free kick awarded. Free kick taken by Valon Behrami. 47:53 Carlton Cole challenges Ryan Shawcross unfairly and gives away a free kick. Thomas Sorensen restarts play with the free kick. 45:00+2:52 The match has reached half-time. 45:00+2:35 The ball is sent over by Julien Faubert. 45:00+2:03 The offside flag is raised against James Beattie. Matthew Upson takes the free kick. 45:00+1:29 Free kick awarded for a foul by Rory Delap on Julien Faubert. Julien Faubert takes the free kick. 45:00+0:57 Jack Collison takes a shot. Blocked by Dean Whitehead. 37:54 James Tomkins takes the free kick. 37:54 Booking Ryan Shawcross goes into the referee's book for unsporting behaviour. 37:42 Ryan Shawcross challenges Alessandro Diamanti unfairly and gives away a free kick. Correction - 36:25 Carlton Cole takes a shot. Rory Delap gets a block in. 36:25 Jack Collison takes a shot. Blocked by Rory Delap. 33:41 The assist for the goal came from Mark Noble. 33:41 GOAL - Matthew Upson:Stoke 1 - 1 West Ham Matthew Upson grabs a headed goal from deep inside the penalty area. Stoke 1-1 West Ham. 32:30 Dean Whitehead concedes a free kick for a foul on Herita Ilunga. Robert Green takes the free kick. 31:23 The ball is delivered by Ricardo Fuller, clearance made by Herita Ilunga. 29:51 A cross is delivered by Dean Whitehead, clearance made by Julien Faubert. Correction - 29:02 Radoslav Kovac takes a shot. Rory Delap gets a block in. 29:02 Radoslav Kovac takes a shot. Blocked by Rory Delap. 27:35 Alessandro Diamanti has an effort direct from the free kick, Thomas Sorensen makes a save. 27:35 Booking Salif Diao receives a caution. 27:19 Unfair challenge on Alessandro Diamanti by Salif Diao results in a free kick. 25:38 Mark Noble sends in a cross, Thomas Sorensen makes a save. 24:41 James Beattie has shot on goal from just outside the area which goes wide of the right-hand upright. 23:53 James Beattie challenges Herita Ilunga unfairly and gives away a free kick. Free kick taken by Herita Ilunga. 20:54 Matthew Etherington has an effort at goal from just outside the box which goes wide of the right-hand upright. 20:09 Alessandro Diamanti crosses the ball. 19:07 Valon Behrami crosses the ball. 18:40 Herita Ilunga sends in a cross, Robert Huth gets a block in. 18:02 Free kick awarded for an unfair challenge on Alessandro Diamanti by Salif Diao. James Tomkins restarts play with the free kick. 17:29 Carlton Cole delivers the ball, Ryan Shawcross manages to make a clearance. 15:33 Short corner taken by Mark Noble. 15:12 Carlton Cole takes a shot. Save by Thomas Sorensen. 14:38 Free kick awarded for an unfair challenge on Mark Noble by Dean Whitehead. Alessandro Diamanti restarts play with the free kick. 13:31 Ryan Shawcross gives away a free kick for an unfair challenge on Matthew Upson. Robert Green takes the indirect free kick. 12:21 Matthew Etherington takes a inswinging corner. 11:55 Matthew Etherington takes a shot. James Tomkins gets a block in. 10:01 Assist on the goal came from Matthew Etherington. 10:01 GOAL - James Beattie:Stoke 1 - 0 West Ham James Beattie scores a power penalty. Stoke 1-0 West Ham. 9:54 Booking Julien Faubert receives a yellow card. Correction - 9:10 Julien Faubert concedes a Penalty for a foul on Matthew Etherington. 9:10 Foul by Julien Faubert on Matthew Etherington, Penalty awarded. 7:22 Free kick awarded for a foul by Carlton Cole on Salif Diao. Abdoulaye Faye restarts play with the free kick. 6:29 Valon Behrami concedes a free kick for a foul on James Beattie. Ryan Shawcross restarts play with the free kick. 5:03 The offside flag is raised against Carlton Cole. Free kick taken by Thomas Sorensen. 3:43 Corner taken by Matthew Etherington, James Tomkins manages to make a clearance. 2:26 Mark Noble produces a right-footed shot from just outside the penalty box that misses to the left of the target. 1:23 Outswinging corner taken from the left by-line by Matthew Etherington, clearance by James Tomkins. 0:23 Free kick awarded for a foul by Salif Diao on Radoslav Kovac. Radoslav Kovac takes the free kick.